Help us to raise awareness of the Fairtrade Mark that guarantees a better deal for Third World producers. This event is part of a campaign to convert Leigh-on-Sea and the Borough of Southend into official Fairtrade areas. Help us MAKE IT HAPPEN. Wholesale Cotton: Quail - Ethical, Fairtrade and organic ladies fashion designed and made in the UK. The Leigh-on-Sea Fairtrade Town Campaign is always on the look out for wholesale suppliers that provide attractive Fairtrade clothing – that we think would appeal to the many independent boutiques we have in our town. We have recently been talking with Quail who provide beautiful Ethical, Fairtrade and organic ladies fashion designed and made in the UK. Take a look at the downloadable look book to see what’s on offer and contact Shauna below for more info. Ethical, Fairtrade and organic ladies fashion designed and made in the UK. Dave Levy of Southend Borough Council is being interviewed about Fairtrade in Southend and Leigh, by Tracie Young on 22/10/2008. Please listen in if you can! 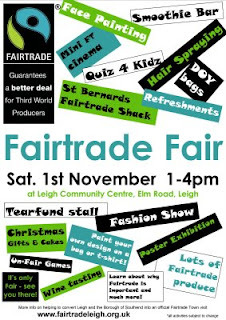 PS Don't forget the Fairtrade Fair on 1st November at Leigh Community Centre, 1-4pm. Help us get as many people along to our fantastic Fairtrade Fair, 1st November 2008, Leigh Community Centre, Elm Road, Leigh from 1-4pm. Please print off and display this poster everywhere you can – in shop windows, in your business staff room, on your church notice board. Add information into your in-house newsletters and events diaries – spread the word. It’s going to be a great event with, activities for all ages and things to do and buy. Help us raise awareness of Fairtrade, guaranteeing a better deal for Third World producers. Did you know there was a Leigh & Southend Fairtrade Town/Borough campaign? A group of volunteers from Leigh on Sea Fairtrade Town Campaign have organised a fun Fairtrade Fair on Saturday 1st November from 1-4pm. Please will you help us to publicise this on your notice boards, and including details in your news sheets and in your announced notices on Sunday? Visit www.fairtradeleigh.org.uk for more information. Do you already use Fairtrade Coffee/Tea/Sugar and Communion Wine at your Church? Please let us know – we can add you to our website and into our online directory. Did you know that your church can register to be an Official Fairtrade Church and receive a pack and certificates to help you promote and celebrate your achievement. Visit this link to find out more: Become a Fairtrade Church. We know there are many more churches which use Fairtrade – just register with the Fairtrade Foundation and let us know too! Publicise your events that use FairtradeIf you have any events coming up where Fairtrade products will be served, used or sold – please let us know. We can help your church with promoting the event via our website www.leighfairtrade.org.uk just email info@fairtradeleigh.org.uk with your news and events.